They just didn't come out the way I wanted them to. But they're silver. Silver's not cheap. Less expensive than it was about 8 to 10 months ago maybe, but it's still a pretty penny. And, I didn't feel like setting them aside until a later time either. Nope, for some reason, my hands just kept going and the ideas flowed and here's what they became. 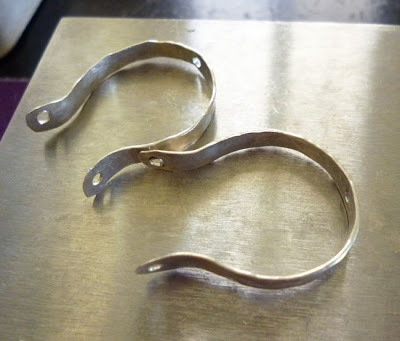 Rugged, mishappen pieces of silver,....like that of an old spur perhaps, or a bridle. So, these became "Horseshoe Pass". Living here in the 'Wild West' can really spur your imagination. What happy mistakes have you made recently? Or, what's your best-ever happy mistake? Peace, Love and Letting It Flow! P.S. - Did any of you happen to catch my little 'MiStake' in the blog title today? They look great... Love the name and the pairing with turquoise. Not only a good save but perhaps one you might repeat?! I love these! Your mistake turned out very pretty! Love your happy mistake, they are beautiful. Isn't it wonderful when it all turns out so beautidul. I don't want to think of my mistakes (happy ones too) on this sunny Sunday morning. Have a great day! Jenni - Yes, I'm definitely repeating them!! Alice - thank you so much! And Regina - thanks and you have a great Sunday as well!! Serendipity happens! Love the hoops and hope you'll happily do more of these. 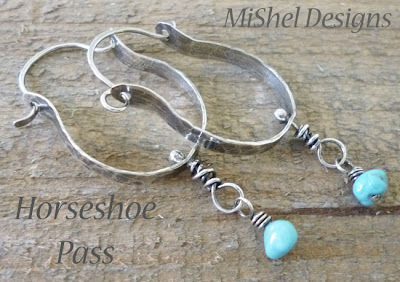 And maybe a new line of jewelry: MiStakes by MiShel ? p.s. and either the robots are getting smarter or I'm losing it, but are the moderation characters getting harder to read lately on blogger sites?? Don't you just love when it all comes together better than anticipated? I love your happy mistake. Lynda - yes, the moderation characters are getting harder to read. It says I've got mine turned off for people to comment, yet that's not the case,...hmmm w/up w/blogger lately? And, cool idea on MiStakes by MiShel!! LOL!! Love it!! 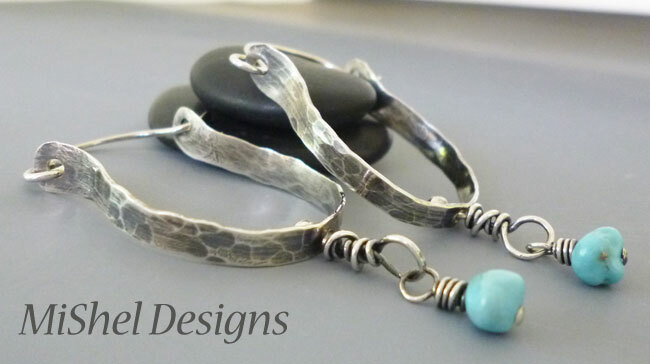 CD, Heidi and Lori - thank you all - glad you like them! I know that they started out as something you hadn't envisioned, but I saw no MiStakes in that. You really did an awesome job forming them into something else and transforming them into what they apparently yearned to be!